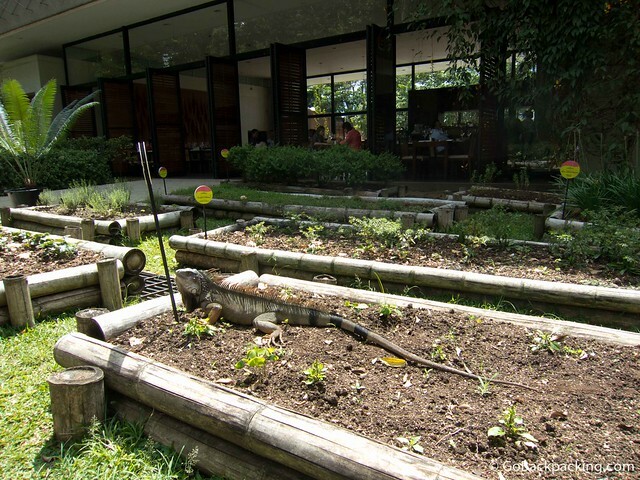 Set in over 13 acres and located just north of the city centre, Jardín Botánico, the botanical gardens, are just a short hop, skip and a jump from Estación Universidad (Linea A), and across the street from Parque Explora and the city’s freshwater aquarium. There are directions that guide you from the metro station to the entrance, so it’s not too difficult for those without a Lonely Planet, or for those whose Google Maps are plotting to take them to Bogotá. It’s free to get in which is a great start. The gardens offer a plethora of different sights and activities to enjoy. They are home to tropical gardens, a butterfly farm, a maze, a lagoon, a science building and a fantastically quirky, and frankly massive, outdoor theatre/event area which is designed in the shape of a bouquet of flowers. It’s called the Orquideorama and it plays host to a variety of different events from yoga to outdoor cinema. Although not the largest botanical gardens on the planet, there is a good variety of plants and wildlife to keep you entertained. The large Iguanas roaming around are a definite photo opportunity and there are a good variety of birds if bird watching is your thing (no judgement here). The general ambience of the gardens is relaxed with families, groups of friends and individuals enjoying the open space and greenery. It is also a hive of activity. On my visit I witnessed a saxophone player, a group of teenagers cheer leading, kids being taught some martial art (I am taking a guess at Kung Fu) and your typical Colombian families enjoy some Salpicon con helado (fruit salad with ice cream). There are plenty of spaces to sit on the grass as well as benches being littered around the park, but bringing a blanket would be a good move so you can enjoy some chill out time on the grass. On the event front, Jardín Botánico publishes the latest things to do on their website and Facebook page, as well as a brochure that they release every three months. There can be last-minute additions to the schedule. For example, there is an outdoor cinema event on Friday, June 20th where you can go and watch a film while sharing a picnic with friends/lovers/your dog. A very welcome alternative to a night practicing your salsa sidestep in Parque Lleras. There is free Atman yoga for beginners on Sunday mornings at 10 a.m. and different yoga sessions throughout the week. There were two groups of around 150 people doing their morning downward dogs when I visited – just bring comfy clothes and a mat. Every first Sunday of the month there is also a Mercado Verde (Green Market) where locals sell organic products. Alongside these regular events, there are a multitude of different programes and festivals that take place throughout the year. There is an impressive orchid display in early August as part of the Feria de Flores (Flower Festival), Vibra Mi Tierra (a beer/music festival) is on from August 23–24 and the Feria de Libros y Cultura (Book and Culture Festival) will be taking place from the 11–21 of September, to mention but a few. The schedule conjures up something new and exciting on a regular basis so be sure to check out their website to be kept up to date on what’s coming up. 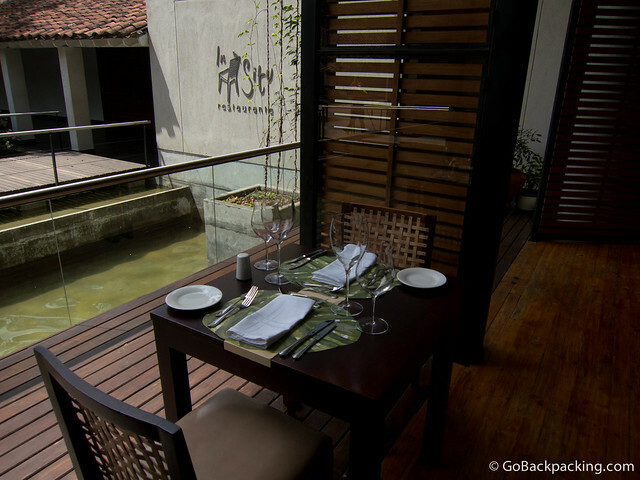 With regards to food, there is a fine dining restaurant called In Situ, and there are also two other cafés, one at the entrance called Café del Bosque and the other named, El Vagon, rather uniquely located in a train carriage in the centre of the gardens. The cafés’ serve up your standard burgers (6,500 pesos, $3.50), sandwiches (10,000 pesos, $5.50) and nachos (6,000 pesos, $3). The food on offer is slightly out of sync with the rest of the green and healthy vibe of the gardens, but it’s at least good to have something to munch on after all that Kung Fu/bird watching. In conclusion, if you are looking for some cool festival/event to impress your new-found friends, want to recover after a big night with a bit of fresh air and nature, spend some down time with a book, or look for somewhere to romance a lady (or man) without having to break the bank, you should definitely take a venture to Jardín Botánico. The gardens offer the perfect respite in what can be quite a bustling city, and you can escape to your own little world for a while. Something we all can do with doing now and again. Nick is an international development professional from the UK and is currently working for an NGO based in Medellin that supports miners and their communities. As well as covering development issues, he hopes to share his insights into life in Medellin and the daily confusion/excitement that comes with living in the city.